Connecticut has organized its best local offerings into “trails” that visitors can easily follow to enjoy the best of the best. One such trail is the Farmers Markets of Connecticut trail, which highlights local markets across the state. At each market, you’ll find freshly picked local produce, delicious baked goods, coffee roasted in Connecticut, and other products to allow you to prepare the freshest most delicious locally-sourced meal for you and your family. Here’s our selection of the 10 best farmers markets in Connecticut! Located on a small green and town pier where commercial fishing boats dock, you’ll find the Stonington Village Farmers Market. This market features amazing pies and baked goods, heirloom vegetables, fresh fruit, jams and jellies, and flowers and herbs to plant at your home. The Stonington Village Farmers Market is held on Saturday mornings throughout the year. If you plan on visiting regularly, sign up for their newsletter to get information for opening days and times as well as vendor lists. Held on the grounds of the historic Nathan Hale Homestead, this market offers history, entertainment, and food. Every Sunday from early June until October, stop by this farmers market for 65 vendors. The range of items being sold is impressive and includes fruit, vegetables, handmade products, honey, sauces, and preserves to name a few. Additionally, there is a wide array of food trucks on site that are certain to quell any hunger pains. Taking place on Saturdays from early June until early October, stop by Bill Hill Road for this farmers market in the picturesque rolling hills of Lyme. Browse the stalls and purchase grass-fed beef, seafood, cheese, fresh fruit and vegetables, and locally roasted Ashlawn Farm Coffee. Children will love the chance to see the nearby cattle, horses, and goats grazing and frolicking on the farm’s grounds. From mid-June until early October, swing by the quaint village of Niantic along the Long Island Sound for its Thursday afternoon farmers market. Approximately 13 local vendors sell their freshly grown goods at this weekly market. At the Niantic Farmers Market, also expect to see plants, breads, baked goods, herbs, hummus, eggs, coffee, and more all available for purchase. Located in one of the best antique destinations in Connecticut, stop by Putnam on Saturdays from early June until late October for their farmers market, and stay a while longer to browse the shops. 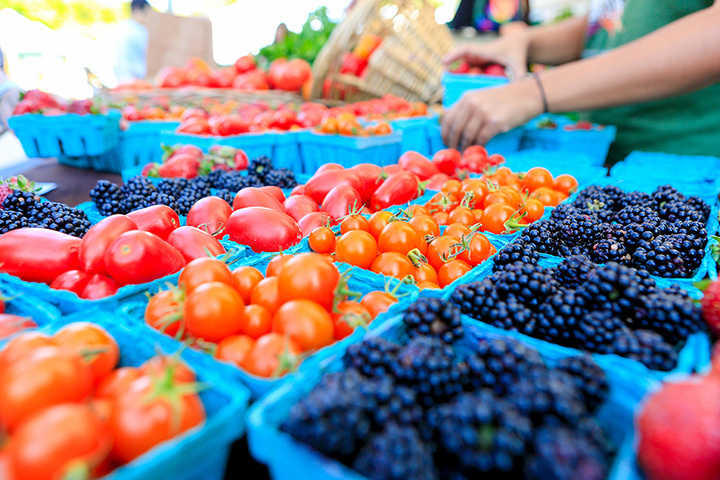 At the Putnam Farmers Market, you’ll find fresh fruit, heritage vegetables, meat, cheese, and other tasty farm goods. Stop by the college town of Storrs on Saturday afternoons for locally grown food. Chat with vendors who are happy to share recipes and growing methods while purchasing locally grown produce, meat, and dairy products for your evening meal. This market is open year-round, so don’t forget to stop by! In historic literary Connecticut, you’ll find the West End Farmers Market. Hosting several organic vegetable farmers, meat producers, and dairies, you are sure to find something healthy to create a delicious meal. The market also features visiting vendors selling sweets, baked goods, and other handmade items. Find a list of vendors and products on their webpage. From winter to spring, summer to fall, stop by the Westport Farmers Market to purchase real local food grown by Connecticut’s farmers. Enjoy drinking a cup of coffee produced from locally grown beans while purchasing your produce and specialty food products for the week. This market sells specialty foods galore, including salsa, tamales, fresh breads, free-range chickens, organic meats, loose leaf teas, and heirloom vegetables, so come prepared with several re-useable bags! Voted Connecticut’s Best Farmers Market by Connecticut Magazine, CitySeed held at Wooster Square should surely be on your list of local markets to visit. Held four times per week, with the largest market on Saturdays at Wooster Square, you’ll find over 35 farmers selling fresh fruit, vegetables, plants, dairy products, preserves, honey, and more. If the delicious food isn’t enough, CitySee also boasts live music, cooking demonstrations, and children’s activities. Located in the picturesque downtown Litchfield near the town green, this market could be visited as part of a Connecticut weekend getaway. The market hosts 20 vendors selling jam, jelly, honey, maple syrup, grass-fed beef, pies, baked goods, cheese, soap, and more. For family-friendly fun, there are also children’s activities, music, and photo opportunities with tractors and farm equipment. Check out the trail map and plan your meal around the fresh produce and goods available at one of Connecticut’s great farmers markets. Make a day out of a market visit by enjoying all each town or city has to offer after a visit to the market. View more Connecticut Farmers Markets.